Take a step back in time to surround yourself in the fascinating history of Brownsville. Dating back to the 1700s, Brownsville was the last supply stop for pioneers traveling west on the National Road. Due to the town’s central location near three early transportation “highways”, the Monongahela River, the Monongahela Railway, and the National Road, the region was a center of commerce, including ship-building. To learn the area’s history, start your day with a visit to the historic Flatiron Building1, at 69 Market Street, housing both the Heritage and Visitors Centers. While there, do not miss the opportunity to visit the included Frank L. Melega Art Museum2, exhibiting Melega’s works relating to local history, as well as ever-changing visiting exhibitions of contemporary artists. In Brownsville, you can visit two historic districts and five individually listed sites on the National Register of Historic Places. Begin at the remarkable Nemacolin Castle3, at 136 Front Street. 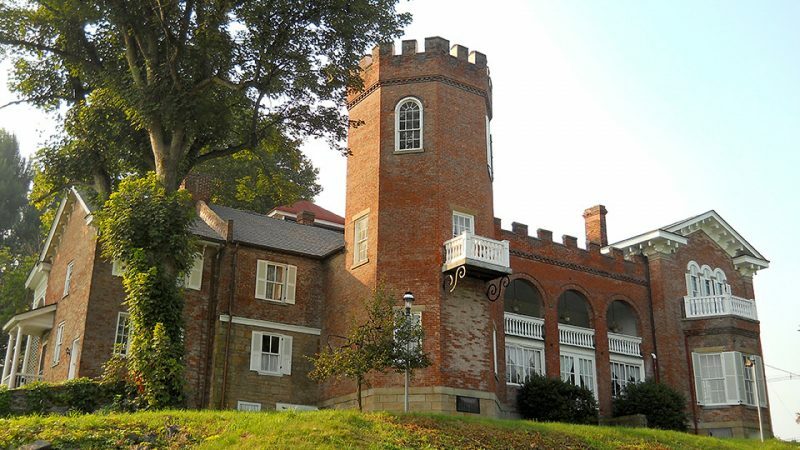 Built in 1789 by Jacob Bowman, the castle sits high on a hillside overlooking the Mon. Tours are available on Saturday and Sunday from noon to 5 pm, $8 for adults and $4 for children ages 12 and under, in addition to special events and tours that occur throughout the year. Leave your vehicle parked at the Castle, and take a stroll to view some marvelous architecture. From Front Street, walk four blocks on 5th Avenue to Church Street. Turn right onto Church Street, where it is impossible to miss the green patina steeple of St. Peter’s Church, located at 118 Church Street. This 1845 Gothic Revival church was the first established Catholic parish in Fayette County and the oldest continuously operating parish in Western Pennsylvania. Believed to be the location of the first Christian service offered west of the Allegheny Mountains, St. Peter’s is listed on the National Register of Historic places. Its cemetery was showcased by “Ripley’s Believe It or Not” as the only cemetery in existence with heated graves. More historic churches line Church Street. Next, head back to your car and drive downtown to enjoy a hot lunch. Pass the Flatiron building and stop at Fiddle’s Confectionary4, tucked under the Intercounty Bridge, at 101 Bridge Street. With a red checkered floor and classic diner stools, it is easy to see why this retro diner has been a town favorite since 1910. Fiddle’s serves a great breakfast throughout the day and All-American classics for lunch. The hotdogs are a local favorite! Work off your full stomach by taking a walk to the Brownsville Riverside Wharf Park. This wharf is site of the 1813 launch of the Brownsville-built “Enterprise”, the first steamboat to travel to New Orleans and return on its own power. 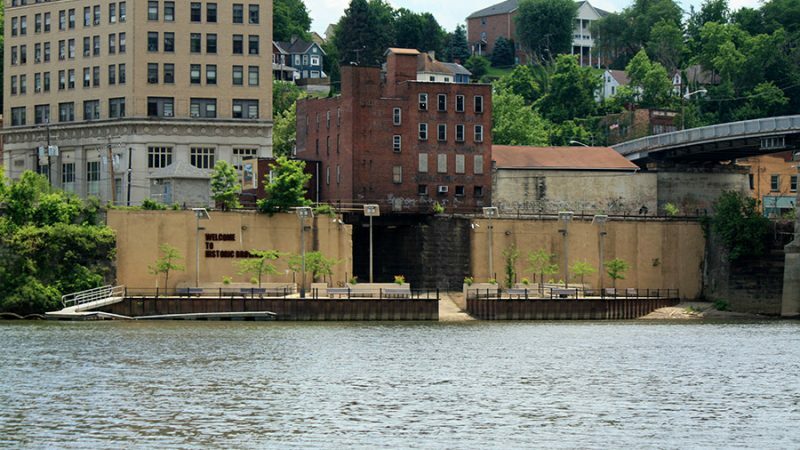 This park has a boat ramp with easy access to the Monongahela River. The boat ramp is steep, so be sure to inspect the site before you drive to the put-in, especially if you have a large boat. A scenic four and a half mile trip downriver brings you to the next boat ramp in California, PA. The Wharf is an excellent fishing spot, but if you want a more remote location, Redstone Creek is only one mile upriver on the eastern river bank. To access this tributary of the Mon, continue on Market Street, and make a slight left onto Albany Road until you reach the creek. If your idea of fun involves less exploration and more relaxation, the Brownsville Wharf and adjacent Central Park have benches and green space for lounging on the river bank. Walking along Market Street away from the wharf, you will reach the Dunlap Creek Bridge, the first cast iron metal arch bridge in the United States! Dedicated on July 4, 1839, the bridge is listed on the National Register of Historic Places and is a National Historic Civil Engineering Landmark. The stately but mostly vacant buildings on Market Street serve as reminders of the grandeur that was once downtown Brownsville. Snowdon Square, to your right, is a short and pleasant walk to view the historic library. After exploring Brownsville, Paci’s Lounge & Dining Room5, located at 384 Old National Pike, West Brownsville, is an appetizing, and historic, final stop. During the heyday of the National Road, a stable was built next to the old Malden Inn to house the horses, coaches, and Conestoga wagons of westbound travelers. Paci’s Lounge and Dining Room now occupies that stable and offers a wide range of dinner entrees, rotating craft beers on tap, and an impressive selection of bottled beers, wines, and spirits. Have a solid meal, having witnessed a bit of past and present day Brownsville.